One of my favorite parts of this job is that I get to work from anywhere with an internet connection, which of course means that I never leave my house. Being the one who is home all day, I am responsible for cooking. Oftentimes, I like to find new culinary ideas, but keeping my phone or tablet on the counter where it's readable can lead to it getting a bit messy. 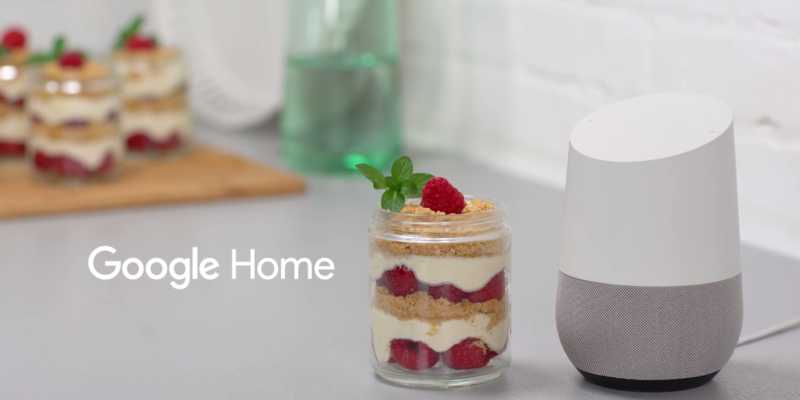 Luckily, my Google Home will soon be able to read off recipes to me, which is just awesome. 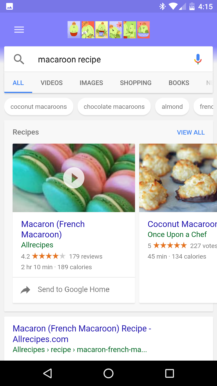 Sourcing over five million recipes from Bon Appetit, The New York Times, Food Network, and others, Assistant on the Home will be right beside you the whole way. To get started, simply find a recipe in Search (or Assistant), select the "Send to Google Home" button, and it'll be all ready to go. Keep in mind that this is limited to phones and tablets right now, so no doing this from your desktop. When the cooking is to commence, tell your Home to "start cooking" or "start recipe." From there, it'll give you the step-by-step instructions. If you missed something or forgot, you can ask for that part to be repeated. While in this process, you can still listen to music, get help with conversions, or whatever else you want to use your Home for (pro tip: "Don't use the general command 'Hey Google, next' when listening to music and cooking instructions at the same time. Instead, use 'Next song' (Music) and 'Next step' (Cooking) to distinguish between the two actions"). 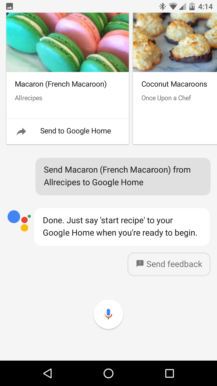 Hear top recipes "Find me a lasagna recipe," "I want to make banana bread"
Start a recipe you’ve sent to Google Home "Start recipe"
“Go to step 5”, “Go to first/last step"
Repeat step or ingredient "Repeat step," "Repeat ingredient"
Get next ingredients "What's the next ingredient? ", "Next ingredient"
Get an ingredient quantity "How much butter?" Get how-to tips "How do I cream sugar and butter?" "Can I replace baking soda with baking powder?" Get a conversion "How many tablespoons in a cup?" "What is 10 ml in fluid ounces?" Set a timer "Set a timer for 10 minutes"
This new feature will be rolling out in the coming week, so be checking your phone. 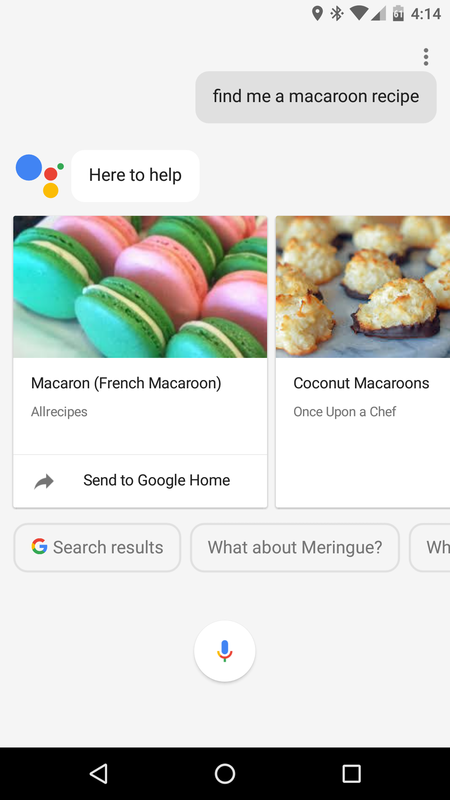 If you're lost or need some inspiration, Assistant can also offer suggestions. Just give it something to go off of, like macaroons or something.